As one of the most spectacular “wonders of the World”, Niagara Falls brings to mind the spectacular falls, daredevils going over it in barrels and the Maid of the Mist boat ride. Staying in Niagara Falls puts you in the center of activities, from viewing the falls on the Canadian and U.S. side, to other area attractions. Visiting between September and April will offer you the best hotel rates, but keep in mind that it gets cold during the winter in Canada. If you can bundle up and work with cold weather, not only are the rates lower, but also it’s spectacular seeing the falls frozen. Magic Savings Tip: Public transportation is available to all attractions. In fact most hotels offer free shuttle services to and from the airport, so why rent a car? Parking at all attractions is very expensive so save some money and forget the car rental. Make sure you view the falls not only during the day, bur at night when it’s illuminated. Viewing the falls from below, on board the Maid of the Mist in your yellow raingear is not only a blast, but also a great photo op. For an exciting way to see the falls, take a ride on the Niagara SkyWheel from 175nfeetnabove the falls. The 8-12 minute ride affords you awesome views of Horseshoe Falls, American Falls and Parks and other landmarks. For the totally brave at heart, try this ride at night. Don’t forget the camera. For a truly unique adventure, a Niagara Falls Helicopter Tour will not only remain in your memories forever, but the photo’s and video’s will be admired by all you share them with. Just one block from the falls you will find the Great Canadian Midway with over 70,000 square feet of fun and excitement for the whole family. Be sure to ride the Ghost Blasters Dark Ride, before that hotdog. For your dining pleasure especially for families, the Rainforest Café is one of the excellent choices. Chomping down a juicy burger in a jungle setting complete with sounds is an experience in itself for you and the kids. For a great steakhouse, it’s hard to beat Ruth’s Chris Steak House where your steak is served to you sizzling hot, guaranteed. 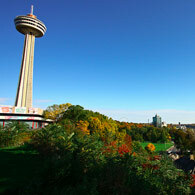 Combine not only two great dining experiences with views of the falls from the top of Skylon Tower. Choose between the Summitt Buffet and the Revolving Dining Room. It’s always exciting to take a trip over the boarder to the American side of Niagara Falls, and view the falls from a different angle. Spend some time shopping and dining in a different country, but be careful what you buy, and keep in mind the name “customs”. 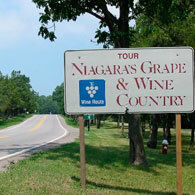 Another super way to spend the day is to take a Niagara-On-The –Lake Winery Tour. If you have a designated driver, you can of course get a map of the wine tour and visit your selections. However, there’s a satisfying feeling of calmness when you take a guided tour with a driver, and you can concentrate on sipping. For more than a century now Niagara Falls has been known as the Honeymoon destination for North America - as well it might, the scenery surrounding the Falls and the sheer grandeur of the Falls themselves brings out the wonder in everybody. But it's also a great place to bring children because they can see the Falls and enjoy the surrounding country side to their heart's content. Just some of the things you can do as a family include; making the short journey to the Bird Kingdom, the world’s largest, indoor, free- flying Aviary featuring over 500 colorful birds. Or take them to the Butterfly Conservatory and watch as the kids become living statues willing the more than 2000 fluttering beauties to gently land on them. Older children will appreciate the chance to ride the elevator down 150 feet and navigate the tunnels at Journey Behind the Falls. It's a real adventure and you enjoy thrilling views of the Falls from below and behind. The adventure starts with a descent by elevator to a short tunnel (150 ft.) which gives you the choice of two outdoor observation decks and two portals located directly behind the Falls. The sound is like a massive, never-ending thunder storm and the sight of tonnes of roaring water will stay with you forever. Essentially, you're 13 storeys below where the water starts to drop and the sight and sound is huge. Did you know there are great Water Parks here just in case the children get a little bored... with all that waterfall water. The Waves Indoor Waterpark is on Lundy's Lane in the Americana Resort in Niagara Falls. It has a wonderful retractable glass roof for year round fun, a wave pool, plenty of water slides, some up to 3 storeys high, kiddie pool, giant tipping bucket and more. 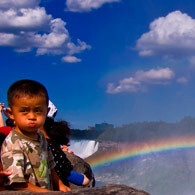 Make sure you get a cheap hotel in Niagara Falls and take the children - there's plenty for everyone to do. See the Falls, enjoy the spa! Of course the first thing everyone does in Niagara Falls is see the falls in all their natural splendor! Stunning, inspiring and awesome are just a few of the superlatives that people use to describe the experience of seeing the Falls for the first time. But there's another side to Niagara Falls... and there's a little bit of luxury involved! Check Cheaprooms.com first of all and find a budget room in Niagara Falls and enjoy the falls and the glorious day spas in Niagara Falls. More than 200 hotel choices means there something for every budget in Niagara. Find cheap accommodation in Niagara Falls and get to know the luxury side of one of America's favorite escape towns. The Five Lakes Spa is an Aveda day spa and it lives up to the promise of heavenly luxury and divine intervention in the ageing process! From the moment you walk in it's all about you, this spa at DoubleTree Fallsview is a full service spa, located in the heart of the Fallsview Tourist District, walking distance from all Fallsview Boulevard hotels. The process starts with a consult that looks at your diet, your lifestyle and your specific body needs, then the spa therapist will design a treatment for you based on the combination of what your body needs. The Spa at the Sterling Inn is close to the falls - about a mile or so. This is a luxury spa and the ambiance, the products they use, and the dreamy sequence of treatments will add up to a memorable day. Even if you're in Niagara for just a few days respite from a busy job, this is a treatment well worth doing. They can concentrate on whatever body part needs the most work - from feet to a full body massage, to facials and skin treatments - so that you return to your normal life refreshed and rejuvenated. The Sense Spa and Boutique is set in one of those beautiful old European style buildings that dot the Niagara landscape. You can settle for a traditional treatment such as manicures and facials to massages and body wraps, or opt for one of the superior treatments perhaps more tailored to a specific issue you want remedied. It's on Lundy's Lane, Niagara Falls about four miles from the Falls. You may not have ever considered the Niagara region as one of the great grape growing regions - but indeed it is - and its reputation continues to grow. Go to Cheaprooms.com and find an excellent value Niagara Falls hotel room and then enjoy some of the other things to do in the area apart from the magnificent falls themselves. If you have four days to spare, a visit to Niagara will repay your interest a hundred times over. Find cheap accommodation in Niagara Falls now and enjoy the cool, crisp air and wonderful spring blooms in this very special part of the world. Twenty-five vineyards dot the landscape just 15 to 20 minutes outside Niagara Falls, on the Canadian side of the border centered around beautiful Niagara-on-the-Lake. Many Niagara wineries have restaurants where they pair their fine wines with regional cuisine, and your hotel can arrange a car or other transport to visit many of them. Chateau des Charmes was founded in 1978 by Paul Michel Bosc, who left France in the sixties to start a new life in Canada. Set against the magnificent Niagara Escarpment, in historic Niagara-on-the-Lake, the winery does indeed look like an 18th century French Chateau. This is a rather grand exercise in fine food and very good wine - you'll enjoy a very special day here. Colaneri Estate Winery is at 348 Concession 6 Road, Niagara-on-the-Lake and again, the grand building will draw you in as soon as you make your way down the drive way. Tastings are mandatory and the glorious scenery will captivate you. Inniskillin Wines is at 1499 Line 3, Niagara-on-the-Lake and is a less imposing building than the first two choices! You can still enjoy superb wines here and the staff are highly wine literate with a sense of real passion for their wines. Just what is the difference between so-called cool climate wines and those from warmer regions? Cool climate viticulture regions produce lighter, fruitier wines while hotter regions produce less fruity, heavier wines. Don't let a little cool weather keep you indoors in one of America's favorite small towns! Check Cheaprooms.com first of all and find a room in Niagara Falls and start preparing your daily activity itinerary. One of the best things about a smaller town is the abundance of things like Farmer's Markets - where the food is genuinely fresh and things like homemade fudge really do get made in someone's home. Find cheap accommodation in Niagara Falls at great shoulder season rates and come and enjoy this perfect small town with its Farmers Market every Saturday morning in Sylvia Place. After you've done the Maid of the Mist and seen the Falls up close take the time to discover the rest of Niagara by choosing a couple of city trails to hike. The parklands and trails are well-maintained and there's a nothing like a fine weather winter hike to make you feel like you've deserved dinner that night. If the weather has really decided to turn against you, don't worry there's plenty to do! Try the Niagara Falls Museum and wander the exhibitions discovering all there is to know about Niagara Falls from its earliest beginnings to the sophisticated tourist zone it is today. They've recently spent more than $12M on a restoration program and the new space is well worth a look. You'll find it at 5810 Ferry St. If you have transport available take a trip to Niagara on the Lake - the town often quoted as the prettiest town in Ontario! A big drawcard is the annual Shaw Festival where the plays of George Bernard Shaw are produced from April to November. A taxi to and fro will cost around $35. A spare afternoon means ... time for wine! The Niagara area has a well-deserved reputation for its glorious ice wines and you can visit many of the wineries for a tasting tour. Ravine Estates Winery offers panoramic views of Niagara-on-the-Lake from the restaurant deck where you can enjoy a serious tasting session as well as indulge in some award-winning cuisine. Any time of year is a great time to visit Niagara Falls. During winter the Falls themselves take on an almost mystical cadence as the chunky water seems to fall in slo-mo down into the raging maelstrom below. Check Cheaprooms.com first of all and get yourself a room in Niagara that's cheap and close to the action. Don't let the cold weather deter you - bundle up and make sure you get plenty of warm drinks inside you while you enjoy one of the most picturesque sites in the world. Find cheap accommodation in Niagara Falls and take full advantage of off-season winter rates. There are literally dozens of activities beside viewing the Falls - for example, go indoor skydiving or go rock climbing - indoors. Niagara has become a haven of wild sports ever since the first man went over the Falls in a barrel. There's even a Daredevil museum that shows off the exploits of extreme sport enthusiasts. The Falls themselves are a great adventure during the winter months as huge chunks of ice drift over the edge. The mist freezes on a cold day and creates a magical landscape in the area surrounding the Falls. You can walk quite close to the Falls without getting wet and just simply view the immense natural power on show. If you have teenagers with you, they might like the 12-lane tubing hill close to downtown Niagara. There's a snowboarding terrain park and a freestyle ski area also close to town. And for adults there are the rather excellent day spa's located close to Niagara - treat yourself to a Vichy rain shower, swim at an indoor salt water pool or indulge in a vinotherapy scrub, using anti-oxidant grapes grown locally. The best of Niagara Falls! When travelling with kids, the first thing to do is know what activities are waiting for you at your preferred destination. There's plenty for families to do in Niagara Falls, so check Cheaprooms.com and get yourself to Niagara Falls with a cheap hotel packageto suit every budget and every family. There's plenty to see apart from the Falls themselves in North America's favorite tourist hotspot, but check the weather forecast for Niagara Falls before you come so you know what you're in for. 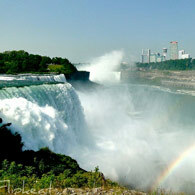 Find somecheap accommodation in Niagara Falls and get ready to enjoy a much-loved destination. There's plenty to do in Niagara Falls besides the Maid of the Mist - you can explore the surrounding cave system on foot or soar above the Falls in a chopper. 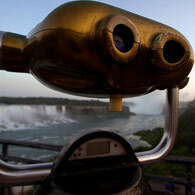 One of the first things to do is check the view from the observation tower in the Skylon Tower. It's big, the view impressive and the sense of grandeur never ending. If you like Forts... would you believe there's a very old one to see in Niagara? Old Fort Niagara is on the US side of the falls and changed hands multiple times between the British, the French and American troops. It's across the river from Niagara-on-the-Lake. It might not sound like a blast, but the Niagara Parks Butterfly Conservatory is wonderful! The 100-acre space is home to dozens of eclectic gardens and the fabulous Butterfly enclosure where thousands of butterflies flit amongst the leaves. 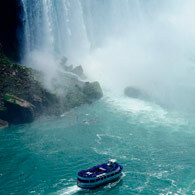 Avoid the pitfalls - see the best of Niagara Falls! Everyone must visit Niagara Falls at some point in their lives! Not only is it a grand spectacle - but your parents and grandparents went there, so why not you! One big pitfall to avoid is expensive hotel accommodation. Check Cheaprooms.com. They have hundreds of hotels to choose from and the range of discount rooms in Niagara Falls is incredible. There's such a lot to see and do in the Niagara area that you won't be bored, believe me. Don't forget that you're crossing into a different country and our big tip is to change currency at a local bank, rather than street vendors and retail shop fronts. There are plenty of banks in the village of Niagara so get a good deal on Cheap Rooms and pack your bags for a entertaining, outdoorsy, active vacation. If the weather turns in and you have restless kids to entertain your answer lies in Ripley's Believe It or Not at Niagara. The legend continues! Sure, the oddities aren't overly odd and the gore, not so gory, but younger children will be thoroughly entertained and you can engage with it as a good-natured ramble through your own childhood. Of course the Falls themselves are what has drawn you here and undoubtedly Niagara are the most spectacular falls in the world, or most accessible spectacular falls anyway. The stats are astounding; more than 6 million cubic feet of water falls over the crest line every minute in high flow, and form the highest flow rate of any waterfall in the world, with a vertical drop of more than 165 feet. Equally impressive is the Maid of the Mist boat tour. You start off down river and head past the American and Bridal Veil Falls, then into the dense mist of spray inside the curve of the Horseshoe Falls. For an extraordinarily view across the Falls and the surrounding countryside - which is indeed magnificent - head up the Skylon Tower in Niagara. It's in the heart of the entertainment and dining district and offers plenty of shopping and dining choices as well as the trip to the top in the yellow 'bug' lift.